For those not lucky enough to travel to the Edinburgh Fringe Festival production of From the Fire this past summer, Eugene Lang College The New School for Liberal Arts is holding a free film screening of the show on Wednesday, November 9. 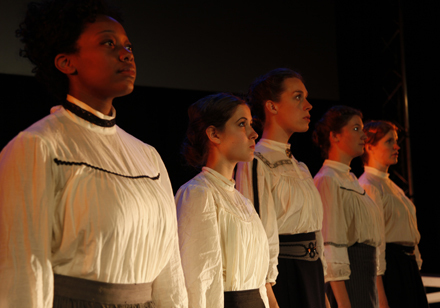 An original oratorio commemorating the centennial of the Triangle Shirtwaist Factory fire, From the Fire picked up awards for Best Musical, Best Music, and Best New Production at the festival. The screening will be held at 8:30 p.m. in Wollman Hall, 65 West 11th Street, Fifth Floor, and is free and open to the public. From the Fire was a collaboration of writer and director Cecilia Rubino, assistant professor of theater at Lang; composer Elizabeth Swados, Lang’s fall 2010 visiting artist; and the poet Paula Finn. After the well-received New York debut of the oratorio last spring, the Eugene Lang College students and faculty were selected to participate in the Edinburgh Fringe Festival in Edinburgh, Scotland. Although From the Fire was revised for the festival run, many of the students in the original cast and crew traveled with the production to Edinburgh. The single greatest workplace tragedy in New York City before 9/11, the Triangle Shirtwaist Factory fire claimed the lives of 146 immigrant garment workers, mostly young girls, and initiated a movement for workplace safety in New York City and across the country. The piece was particularly poignant to the Lang students in the cast, most of whom were the same age as the young women killed in the blaze. This is the first New York screening of the Edinburgh performance. To learn about future screenings and events, please visit the From the Fire website. A behind-the-scenes look at the making of From the Fire, and what the story meant to the students who help bring it to life, is available here.